Hospice is not a place, but rather a type of care that can take place wherever a patient considers home. 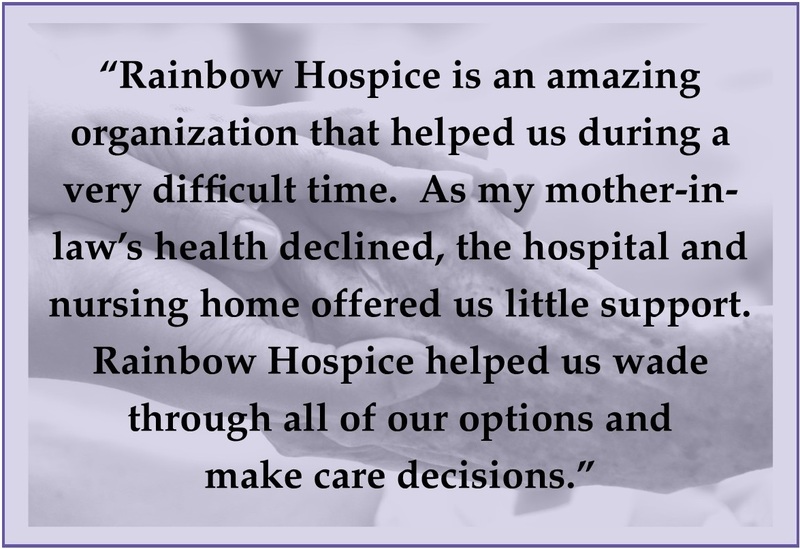 In most cases, hospice care is provided in the patient’s home, but it can also be at a hospital or the Rainbow Hospice inpatient unit, the Ark. Hospice care offers a multidisciplinary approach that caters to each individual’s unique needs. The interdisciplinary team works together to address patients’ physical, emotional and spiritual needs, and relieve pain and other distressing symptoms. This team consists of physicians, nurses, home health aides, spiritual care providers, social workers, trained volunteers and other support staff who work with the patient, family and the patient’s existing doctors to establish an individualized care plan. The hospice benefit is typically covered by Medicare, Medicaid and most private insurances. This benefit provides medical equipment such as a hospital bed, commode, and oxygen, along with supplies and prescribed medications for pain and symptom relief related to a patient’s diagnosis. Rainbow has never turned away a patient based on his or her ability to pay. The support that hospice brings extends beyond the patient to the patient’s loved ones. Although the disease and its symptoms happen to the patient, the illness affects the entire family. Hospice continues to support the family after the patient has passed away, providing as much involvement as the family wishes. When facing serious illness, it is important for patients and families to remember that there is much to hope for. Hospice helps people achieve their goals and supports the family as they care for their loved one so they can focus on what matters most. Please do not hesitate to call us anytime, day or night at 847-685-9900.